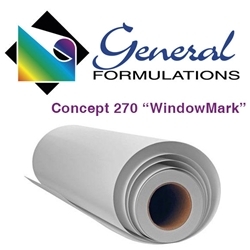 Concept 270 is a 6.0 mil white front side and black adhesive side flexible vinyl film with a clear removable acrylic pressure sensitive adhesive on a layflat liner. This film is designed to accept a variety of solvent-based, including ecosolve, UV and Latex inks common to wide format digital printing. The removable pressure sensitive adhesive is designed for excellent compatibility with vinyl films to give clean removal from glass. The two layer perforated liner system allows for UV digital printing of this product.